PT PP (Persero) Tbk - PTPP (IDX Stock Code: PTPP) is a trusted and reliable state-owned company in Indonesia, running business in general construction industry. Based in Jakarta, PT PP has 64 years successful operation in Indonesia. PT PP has experience in developing prestigious buildings, infrastructure, property and EPC. 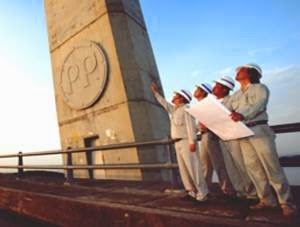 PT PP has its business activities focused in Construction, Property, EPC, Precast, Equipment and Investment. PT PP is a public listed company with majority share holder by the Government of Indonesia. At present, PT PP is 51% owned by the Government of Indonesia, 0.10% by employees and employees cooperative of PT PP and 48.9% by general public. As of December 2016, PT PP runs its business through 5 divisions; operation divisions I, operation division II, operation division III, operation division IV and EPC division. PT PP conducted business operations in all parts of Indonesia under the management of 9 domestic branch offices. The Company's head office is registered at Plaza PP - Wisma Subiyanto, Jl TB Simatupang 57, Pasar Rebo Jakarta Timur 13760. According to PT PP (Persero) Tbk Annual Report 2016 as cited by JobsCDC.com, PT PP’s business results in 2016 showed improved performance compared to 2015. PT PP posted total new contract of Rp32.6 trillion throughout 2016. This amount is an increase of 20.41% over the same period in 2015 amounted to Rp27.07 trillion. Referring to its annual report, PT PP booked total operating income of Rp1.97 trillion in 2016, up 23.41% from Rp1.60 trillion in 2015. Candidate must possess education at least Diploma Degree (D3) majoring in Civil Engineering. Minimum 3 years of experience as an executor in the field of high-rise building. Mastering the method of high-rise building construction work. Willing to be placed in all projects PT PP (Persero) Tbk (outside java and abroad). Minimum 3 years of experience as an executor in the field of Roads, bridges, weirs, harbors. Mastering the method of Roads, bridges, weirs, harbors construction work. Male / Female, maximum age of 28 years old. Candidate must possess education at least Bachelor Degree from reputable university with GPA ≥ 3.00, majoring in Economics, Financial Management and Accounting. Fluent in English (Minimum TOEFL score of 450). Have experience in campus organization is preferred. Candidate must possess education at least Vocational High School (SMK) majoring in Concrete Construction Engineering, Building Drawing Engineering. Minimum 1 year of experience as an executor in the field of high-rise buildings or civil works (roads, bridges, dams and harbors). Mastering the method of high-rise buildings or civil construction works (roads, bridges, dams and harbors). JobsCDC.com now available on android device. Download now on Google Play here. Please be aware of recruitment fraud. The entire stage of this selection process is free of charge. PT PP (Persero) Tbk - Recruitment SMK, D3, S1 Regular, Professional PT PP August 2017 will never ask for fees or upfront payments for any purposes during the recruitment process such as transportation and accommodation.